Baba took Udhi from my hand and applied it to my forehead - a mark of favor and love that is not bestowed on all. Again when people were assembling for Arati at the Masjid, and I was among them, Baba asked me to go and take my meal. I said it was Ekadasi. Usually I did not fast on Ekadasi days; but my two friends did and I had to conform to their ways and not be singular and claiming advantages which they did not share. But Baba did not want me to fast. He said (referring to my companions) "These people are mad, You had better go to the Wada and eat." The person who had to serve the food at the wada was grumbling that I should be clamoring for food on an Ekadasi day and would not give me food till Arati was over. So he came to the Mosque and I also returned to the Mosque. Baba again questioned me if I had messed but I said that it was time for Arati and so the meal might be deferred till the completion of the Arati. But Baba insisted and said "The Arati will wait and will begin after you finish your meal and come." The hotel man had to yield and gave me food. Then I went to the Mosque for the Arati. At that time a lady generally known as "Mavusi" brought beeda (i.e., rolled up betel and nut) to Baba. Baba gave me some and asked me to eat. As it is usual to avoid chewing betel and nut (which are considered as luxuries and for that and other reasons avoided on Ekadasi days) I hesitated. Baba said again, "Eat it." I obeyed and chewed the beeda. At the close of the Arati, Baba took dakshina of Rs.4 from me and Rs.16 from Vaidya. He did not ask Date for dakshina, as he was evidently not disposed to give it. There was a young Marwadi girl that was hankering after fruit and asked Baba for "orange". Baba by his own powers knew that Date had kept back some oranges at the wada and brought only the remainder to be offered at the Mosque and so asked Date to go and get the oranges. But Date was assertive and said that the fruit was retained by him for "Faral", i.e., his own light meal on the Ekadasi day. He declined to part with it, despite Baba's request. Baba did not press his request further. During our stay, Baba revealed his interest in me and my family. When H.S.Dixit, Jog and Dabolkar were present, He told them, “I had been to this man's house" - and here he pointed to me - "for a meal. He did not give me Bendi Baji". My mind darted back at once to the Sadhu who in 1909 at the time of my brother's operation was dining with us. And I felt assured that in the form of one Sadhu or another, Baba was interested in our welfare and helping us even in 1909 unknown to ourselves. Later, I told those gentlemen of the "Bendi Baji" which my sister-in-law had first failed to serve the Sadhu on that occasion. That Sadhu appeared to be an entirely different man from Sai Baba. I saw him also on the two or three days following the operation at Dahanu and had excellent opportunities of observing him at close quarters. He went away from Dahanu and was not seen again thereafter. Baba was declaring in 1912 to me that he was the same Sadhu or was in that Sadhu despite external differences in appearance, caste, etc. That Sadhu was a Hindu, rather dark or brownish, and had a fairly long beard such as was never on Baba's chin. He looked more like you (B.V.N.Swami) than like Sai Baba. I asked Baba about the result I would have in my examination. He said "Allah Malik Hai” and placed his palm on my head. I passed that examination. The impressions I received at this first visit were in danger of being blotted out on the last day. That morning we found Baba was in tearing rage at the Mosque for no reason that any one could make out. He was jumping about the floor of the Mosque. His eyes were red and for fifteen minutes he kept every one in terror of him and none dared to approach him. That made us doubt again if the Station Master's view that Baba was a mad man was not right after all. At last, Baba cooled down and we approached him for leave to go away from Shirdi. He gave us Udhi and leave. In 1915 Baba gave me another blessing (unasked). I was then employed at Dahanu (Thana District). It is not easy to get a transfer from Mofussil service to Metropolis service. But Baba said in 1912 "Come to Bombay for service". In 1918 this prophecy or blessing had its fulfillment or effect by my being transferred to Bandra, i.e., Bombay Suburban District. The breach of duty that Baba pointed out, viz., being absent from office without leave of my superior, the Mamlatdar, was noticed by the latter, Mr.B.V.Dev. But, providentially his order was merely that if I were to do so again I would be punished. After this first visit I was going oftentimes to Shirdi. On one occasion, (i.e., in 1913) as I was starting, Haribhav M. Panse met me. He had been convicted for misappropriation and sentenced to imprisonment but had been just then let out on bail pending his appeal. He was going up for the appeal which was to be heard that day or the next and he told me to entreat Sai Baba's aid on his behalf. "Tell him that I am in trouble and that I am innocent”, he said. I went to Shirdi and before I could communicate the message, Baba himself spoke about it. It was at the early morning Arati (Kakada) at the Chavadi. Baba was in a very angry mood. He then told me, "Tell him that he need not have any anxiety and that he will be acquitted in the appeal." When I returned from Shirdi, I met Panse and told him of Baba's reply. At that time he informed me that he had indeed been acquitted. When I was at Shirdi, about this time, (i.e., in 1913 or so) Baba made an observation that we should not trust mad men. This commonplace altruism appeared to have no reference to or significance for me. But what happened in 1914 showed that it was not a truism, but a warning to me. I was Treasury Master in 1914 at Dahanu. I was engaged in my daily Pooja at home worshipping Sai Baba's photo, Gods, etc. One Ramakrishna Balawant Panse who was deranged in his intellect was standing at the door of the cuisine, a little distance from my worship room. He was thought to be rather harmless; and none minded him. Suddenly the man flew at me and grasped my neck with both his arms and tried to bite my throat saying, "I will drink your blood". Instantaneously, with one hand I held the strong metallic spoon (used for Pooja) and thrust that and my finger into his mouth. The spoon struck in his throat and the man was biting away my finger with his teeth. With the other hand I tried to extricate my neck from his hands. My mother also rushed in to help. Meanwhile I lost consciousness. After sometime and by some remedial application I recovered consciousness; his nails had dug into the flesh of my neck and he had very nearly strangled me to death. The injury on my fingers also was healed. When next I went to Shirdi. "Anna, if I had delayed an instant, then this man would have indeed perished. The mad man had seized with his hands his very throat. But I extricated him. What is to be done? If I do not save my own children, who else will?" On 31-3-1915 we had a very thrilling encounter. Myself, Santaram Moreswar Panse and some others were traveling in a bullock cart at night in a dense jungle. We were at the Ranshet Pass. It was known to be infested with tigers. It was a dark night. Suddenly our bulls took fright and were stepping backwards. Luckily they were not dragging the cart sideways. In that narrow pass, if our cart had swerved a little to the side, cart, bulls and ourselves would have fallen down a steep ravine and perished. Santaram showed me by pointing his hand in front what the trouble was. In front of our carriage we saw the gleaming eyes of a tiger on the road. It was couchant and faced us. Panse to save the cart from being pushed into the ravine wished to get down to place a big stone or stick as a brake to block the wheel going back and asked me to hold the reins of the bulls. I held them and roared aloud "Hail Sai Baba! Run, Sri Sai Baba (to our aid)" Others also began to shout and the tiger got frightened and ran away passing by the side of our cart. My faith in Baba and the courage he infused into me by making me call out his name thus saved the situation. Once when I was at Shirdi, Sankar Rao (Balkrishna Vaidya) came there. Baba asked him for Rs.16 dakshina. He pleaded want of money. A little later, Baba asked him for Rs.32. Again he put forward the same plea. A little later Baba asked him for Rs.64. Then we told Baba we were not rich enough to pay such large sums. Then Baba said collect the amount and pay. This proved to be a prophecy. Sometime later, Baba fell ill. A sapthaha was celebrated and it had to be followed by a grand feast to be given to all comers on a large scale. Moneys had to be collected. At the bidding of Dabolkar, Sankar Rao and I started with the hat in my hand. The collection then made by us totalled exactly Rs.64 and it was sent up. I gave Baba's Udhi to Ravji Sakharam Vaidya to apply to his daughter "Moru" who was having "Plague" fever. It subsided. My father was something of a doctor. Parasuram Apaji Nachne, a Talati, had longstanding illness. My father and other medical men despaired of his recovery. But by vows and prayers to Baba and burning Udbatti before his picture with a perpetual ghee lamp he recovered his health. When I and S.B.Vaidya went to Baba in 1915, the later presented Silver padukas to Baba with a view to get them back again for his worship. But Baba presented them to me. I thought it but right that they should go to Vaidya and gave them to him. But on Madhava Rao Deshpande's intervention they were again transferred to me. Vaidya had another pair of silver padukas. Baba himself asked Vaidya for that pair and presented that also to me, saying "Keep this and do Pooja". I said that was Vaidya's property and must go to him. Baba said "Keep it for the present, you can give it to him later." I kept it then and later presented one pair to Vaidya. Adhering to chronological order, I may mention one instance of Baba's justice and fair play; in which he plucked the feathers off Orthodox intolerance. In May 1915, I went to Shirdi accompanied by my mother-in-law and others. We put up at the "Sathe Wada" (as it was then called; since then it has changed hands and become Navalkar Wada) and Dada Kelkar was living in part of the premises. When my mother-in-law was cutting onions for our meal, Dada Kelkar, an orthodox Brahmin, who abhorred onion got irritated and fell foul of her. She took his abuse very much to heart. A few hours later, Dada's grand-daughter was crying on account of severe pain in her eyes and he went to Baba for relief. Baba then told him to foment the eyes with onion. Dada asked "Where am I get onion?" Baba always kept some onion with him and perhaps Dada hoped to get his supply from Baba. But that just arbiter was keeping some designs up his sleeve and told Dada "Get it from this ayi, i.e., mother," pointing to my mother-in-law. Baba was giving her the chance of relieving her pent up feelings and taking noble revenge by returning good for evil. She told Baba that Dada had been abusing her that very morning for using onions for preparing her meal, and that she would not care to give him anything but if it was Baba's order that she should give him onions, she would. Baba ordered the gift and she had her grand revenge of doing good to one who had so recently lacerated her feelings. It was in the same year that my mother-in-law was anxious to get Baba's blessing, to obtain progeny for me. A few children were born before that but they died when quite young. So at her request, Madhav Rao Deshpande took my wife to Baba and wanted Baba to give her a coconut as a gift and throw it into her Padar (Mundani or end of her cloth). Then Baba's eyes brimmed with tears as he gave the coconut to my wife; and he bade me sit at his feet and massage his legs. As I was doing so, he made passes with his hand over my back. I felt very grateful for his kindness and I referred to the mad man's attempt to murder me and to Baba's photo being with me at the time as the explanation for my narrow escape. Baba merely remarked, "Allah Malik Hai. God is the Lord, i.e., He orders all things." Then Baba and I embraced each other. Baba showed me once again how considerate he was towards all his devotees and how strongly he was against one devotee teasing or interfering with another. One day Baba said "My stomach is aching." Mavusi, the strong lady that I have already mentioned, brought a red hot brick and placed it on Baba's abdomen, i.e., above his Kupni, and retained it in that position for about ten minutes. I felt very much for Baba, as I was shampooing his feet at that time, and thought her service an instance of "cruel kindness". Then she removed the brick and began pressing Baba's sides with her hands with great violence. I could not endure the sight, and I told her to be gentle as Baba would suffer. Baba at once ordered me to get away. I did. That night, about 8 PM, I went to the Masjid and asked Baba to give me some anugraha. "What Japa shall I make?" I asked. Baba replied, "Go to Devpur (a village 20 miles off Kopergaon) and begin worshipping the stones there which your ancestors worshipped." Later on, I returned to Dahanu and asked my father what Baba's words might import. Then my father gave me an account of our ancestral worship of images at Devpur. Baba Prayag, my ancestor, had no issue till he was 60 years old. He learnt that issue was often obtained by others by the grace of a saint then living, named Baba Bhagavat (who was a disciple of Eknath Maharaj) and that B.Bhagavat could be seen at Triambak on those rare occasions when he would go to see the Nivritti Nath Shrine there. B.P. went there and obtained his grace and blessings for issue with a coconut. Thereafter, i.e., at the age of 61, B.P. got a son, whom he named Krishna Rao. Baba Bhagawat took that child, when it was but one year old to Devpur and gave it a handwritten copy of Jnaneswari. (This identical copy is now produced. Note: Just as it is produced, some music is heard passing in the street). Whenever this copy is taken out some auspicious signs are always found attending. From that time forward, every member of our family in his generation takes Upadesh from a member of that Guru's line. This fact it is that made Sai Baba give me the above answer. (At that time I did not know all these facts. But my father to whom I communicated the answer of Baba narrated these facts to me). In 1916, by Baba's grace, I was saved from a watery grave. There was Plague at Dahanu and I had daily to cross a creek between my house and my office. One day I returned from the office very late and there was no ferry boat. I then took a toni (Tamil “thoni" or Canoe) with a boy to paddle, and it got upset in the middle of the creek. I had swerved just a bit but that was enough to make the little canoe capsize. From the time it capsized I had my dhyana of Sai Baba. The boy who was rowing or paddling the canoe was a good swimmer and a resourceful lad. He asked me to hold on to a rope that was above water connecting a buoy with a ship which was at a little distance from us. I caught it and with its help kept my head above water. The boy hallooed to the ship and the shipmen sent us a boat and saved us. In 1919, I had a son born to me; and this was the first son born after Baba gave my wife the coconut, with blessings from his mouth and with tears in his eyes. We named him Kaluram. To explain Baba's tears a few facts about Kaluram's short life of eight years may be mentioned. He was born under the constellation Moola. When the boy was only three years old he was always repeating the mantra 'Ram Hari Ram’. It was in 1921, i.e., when he was entering on his third year, the effect of Moola was seen. His mother i.e., my first wife, died. No doubt the deeply sympathetic heart of Baba saw her coming end when he gave her the "blessing" (?) for a child to be born under Moola. Anyhow, one might suppose that there was the mitigation of the sorrow in having brought a saintly infant prodigy into existence. But see what followed even in that matter. The boy was stunning the imagination of all that became acquainted with him. A pious and learned neighbor, named Hegde, watched him and declared that he was an incarnation of that playmate of Sri Krishna on whose back the latter got up to invade curd-pots. The boy himself stated occasionally "Krishna used to tease me. I caught hold of Hari's leg and pinched them. I looked up. Hari (who was standing above me) upset the curd-pot over my face. Then the lady of the house turned up, etc." The boy sometimes anticipated Hegde's daily study of "Hari Vijaya" and declared what stories or incidents formed the subject matter of the portion to be read on the particular day by Hegde. I saw him one day seated in a corner, with his head covered by a cloth. He was motionless and steady like one immersed in Yoga. His eyeballs were upturned, but the cloth over his head that was worn like a cowl hid the eyes from my view. I lifted the cloth and asked him why he was covering his head. He said he was always doing so. Asked why he went on with his course of Sadhana, he laughed. His precocity surprised me greatly. Once he asked me to get for him the latest special issue of a journal (Sandesh). When that was brought, the first picture on it was Sri Krishna's encircled by the Pranava "Aum". Kalu cut out that picture and stuck it on the wall. Then there was the advertisement of "His Master's Voice" records with the picture of the dog before the gramaphone. Kalu's interrogation thereon was typical of him. I: It is the advertisement of a phonograph. He: It is a special message of Krishna. I: What is the special message? He: What is the dog hearing? I: The music played by the plate. He: The dog hears his master's voice. See the dog, so steady from head to tail, intently listening. We must be equally firm and steady. See how I sit. You also should sit like that and listen and then you will hear Baba's voice. I: How do you know Baba's voice? He: I know. I will not tell you. Experience it yourself. In addition to his oral Japa of "Ram Hari Ram," Kaluram was going on writing that mantra in chits and a quantity of them were with us. When Upasani Baba came to Andheri, he said he wanted such chits and they were handed over to him. In 1924 Gadgi Baba came over to my house to see this boy. In 1926, Kalu had dropsy and low fever. We gave him only Baba's Udhi. The disease continued for a while. On Kartik Sudha Ekadasi (so piously celebrated by thousands of pilgrims at Pandharpur and other Vishnu Sthalas), Kaluram approached his end. He called me to his bedside and asked for Jnaneswari. It was at once produced. He himself opened it and picked up the XIII Chapter. At that time I was feeling the sadness of the approaching end, the bitterness that we had to part with such a son. But Kalu cheered me up and said, "What is there to cry for? Read this (Ch. XIII). Read it aloud for me. I am going to-day." My heart was sinking under a load of grief and I could not read it. Then he kept the book in front of him and breathed his last. A fitting termination, this departure on Kartik Ekadasi, was for such a life. But yet how sad was such an early death? No wonder that Baba wept in 1918 when he gave the coconut and clearly perceived that such an early death was to crown such a life. As for the continuance of my line, by Baba's blessings, that was made secure. In 1922, i.e., one year after Kaluram's mother died, my parents were arranging for my second marriage. A choice had to be made between a girl that would bring some wealth or pecuniary contribution with her and a poor girl. The proposal of the first girl that would bring in Rs.600 was being considered by my father. I did not favor it. Baba came in my mother's dream and said to her "Do not accept this girl in marriage for your son." In the same dream my mother saw another girl. A little later the uncle and guardian of a poor girl offered her hand in marriage to me. I referred him to my mother. She saw the girl and found it was the very girl she had seen in the above-mentioned dream. This settled the question and the latter girl was married to me in 1922, and several children were born of this marriage and with Baba's blessings are getting on well. "Baba's blessings" is no empty formal phrase. I will cite several instances to show how he has guarded them and saved their lives as he saved mine (at least twice, as already mentioned by me). In 1926, my son, Sainath alias Hareswar, was eight or nine months old. Kaluram had crackers and Bengal matches. One of my children threw away a lighted match. It fell on Sainath and his clothes caught fire. He wore a cloth beneath his waist and a frock next to the skin. Both these caught fire. The children did not realise the seriousness of the situation and raised no alarm. My wife was outside the house engaged with something. Suddenly a Fakir appeared before her and pointing his arm and finger towards the terrace on which the children were playing, said "See what is going on there." My wife at once went inside and noticed the fire on the child's clothes. With great presence of mind and resourcefulness, she ran to the child, seized the clothes and rolled them between her palms and thus boldly extinguished the fire. The front half of the frock from bottom to the neck was burnt out and part of the nether cloth also. But the child (Sainath) came off entirely scatheless. Though the frock worn next to the skin was burnt out, his skin had not been burnt, nor was his nether portion burnt. This complete safety was evidently due to the same cause as the sudden appearance of the Fakir. The Fakir had also suddenly disappeared. When she came out after extinguishing the fire, there was no trace of the Fakir. Who could the Fakir be, how had he known the fire accident the very moment it happened and why should he be at the trouble to watch over the children and fetch their mother to save them at the nick of time? In 1928, Sainath, then two years old, had an accident. As usual he was running about; and one day he fell down the stairs. There was a heap of the debris at the bottom, I ran up and was surprised to see him standing without any injury at all. He told me, "Do not fear. Baba bore me up." In 1932, Sainath gave his younger brother Vasudev a ring and the latter stuffed it into his mouth instinctively. The ring went into the throat and stuck there. There was an alarm and for nearly one hour every one in the house was excited and medicaments were tried to induce the throat or stomach to throw out the ring. Finally, I took Sai Baba's Udhi and put it in the child's mouth. Then inserting my finger deep within his mouth, I felt the ring and pulled it out. In 1934, the same child Vasudev had measles, pneumonia and an abscess on the chest. He was getting weaker and weaker. The doctor was afraid to operate on the abscess on account of the weakness. I applied antiphlogistine over the abscess. The abscess was opened. It was a wide open wound. The doctor would not help me. 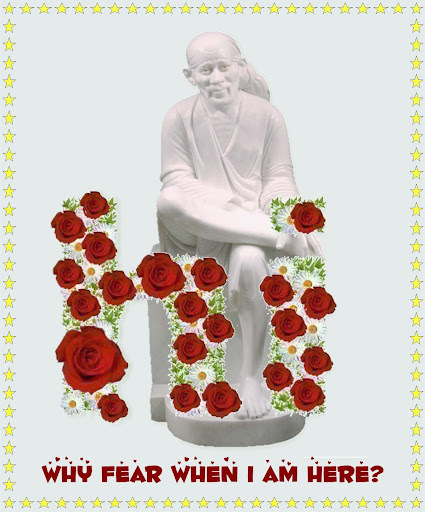 So I relied upon my doctor, Sai Baba, and trusting in him put a bit of his Udhi into the wound. The Deputy Collector, Vasant Rao Madhav Jadhav, (now D.C. at Poona) asked me whether I was confident of a cure and within what time the gaping wound would be cured. I answered "In 24 hours." That night, Baba appeared in my dream and said, "Why did you say 24 hours? You should have said immediately." I apologized for my mistake in the dream itself. Next morning, the wound was healed up. Jadhav wondered and wanted Baba's Udhi and blessing for his own son aged 4 1/2 years who was down with pneumonia. I gave him the Udhi on the sixth day of that child's fever. The very next day the fever stopped, though the attendant doctor stated that the fever would run its course for 9 days (i.e., that it would last 3 days after I gave the Udhi). Jadhav sent up his thanks offering of Rs.7 to be sent to Sri Sai Baba's Samasthan. In 1935, i.e., last year, milk was being boiled on my stove. Anand, my two-year-old child, came running up, stumbled over a stick and fell upon the milk and stove. Just fancy what should happen in such a case. One would expect his skin to be scalded by the boiling milk and clothes to catch fire. But here the milk was dashed down on one side and the stove on the other side; and the child lay between the two, neither scalded, nor catching fire on his clothes. This year, i.e., 1936, Vasudev and his younger brother rummaged among the contents of an almyrah and found a box full of what they thought to be peppermint lozenges. Vasudev ate some and gave some to his younger brother. The taste was unpleasant and they did not eat much. But what little was eaten made Vasu smart. His tongue was protruding. My wife inserted her finger into his mouth and extracted what she believed to be chunam, i.e., lime. We were then shown by Vasu the packet or box of "Sweetmeats" that he had been consuming. It was "Pharoah's snakes" - the piece of fireworks that burn out forming ashes that lengthen and wind about in the form of snakes. We then took him to the doctor who administered an emetic, which did not act. Then I gave Baba's Udhi and Tirtha - which acted at once and resulted in his vomiting out all the poisonous stuff he had swallowed. After all this was over, Vasudev mentioned that he had given the Peppermint to his two year old younger brother. Evidently the latter ate but little, as there was no trouble. But to expel what little he might have swallowed, we administered our emetic, viz., Udhi and water with Baba's name to him and he had a good vomit. A cashier in an office was in trouble last year about Rs.3,500 which was not accounted for. A friend advised him to go to me and he came. That cashier disliked Baba, as Baba was 'Mohamedan'. But when he came to me, I told him that his sole sanctuary was the Sai Mandir at Shirdi, and that he should go there and make a heartfelt apology and appeal for help. He went there, got a photo of Baba and with the help of Sagun Naik placed it at the Samadhi, prayed there and came back with the photo. Things then began to brighten up. He was allowed eight days time to pay up the Rs.3,500. He went up, got money and paid it. The matter was closed. There was neither dismissal nor prosecution. Similar help was rendered by Baba in another case. Mr.V.C. Chitnis after his dismissal from service came to me. I told him to cast his burden on Sai Baba and make an appeal at the Shirdi Mandir for help. He went to Shirdi and later he was reinstated in service. I shall mention what help Baba gave to members of my family, for Sadgati, i.e., at or after death. My parents were devotees of Sai Baba. My mother was aged seventy in 1926 when she died. She kept Sai Baba's photo to the last in front of her. As the end was nearing, she asked me to read Vishnu Sahasranama aloud by her side, and I did. Then with "Ram Ram" on her lips, she passed away. My second wife passed away in 1929 and I was anxious to do everything necessary to secure Sadgati for her soul. So I wished to take her bones and ashes to Nasik and dispose of them there with proper ceremonies. But I was beset with difficulties. My father was ill. I had, amidst my feeling of bitter loss at her departure, to make sure of the funds needed and the steps necessary, of which I had no idea. I took a sum of Rs.80 and leaving a child of three years at home, started by train for Nasik. At Victoria Terminus, I found I had a fellow passenger who took enormous trouble for me and extended his sympathy and help even before the train started. He: Where are you going? He: Why do you carry no bed? The nights are chill. I: I find no necessity. I am in no mood to mind these things. It is eight days since my wife died leaving a three-year old son to be taken care of by me. He asked me to wait. He called out a friend and got a blanket and a bedsheet for me. I: How can you get these things so quickly? He: Our quarters are very near. It is the Bombay Arts School. Have this Cigar please. I: (accepting the cigar) What is your name? May I know who you are? He: I am a peon in that school. My name is Ganapathy Shankar - you may go to sleep now. Have no anxiety. I am also going to Nasik. I shall wake you up when we reach. I: What takes you to Nasik? G.S: Simply to see Nasik. My Saheb is gone to Simla and I get this chance of seeing Nasik. G.S. : "Do take good care of your money; or if you like, I will keep it for you, if you give it to me, in this steel trunk of mine. Then I handed over my 80 rupees to him and went to sleep. At Ghoti Station, near Nasik, he woke me up. We washed ourselves and took tea. He paid for me also. At Nasik Road Station, we got into the bus. Then. G.S: Do not go to Bhatji, i.e., a priest yourself. I will settle everything for you. Do not trouble yourself. Then he attended on me and attended to everything as a peon would do, till the end of the twelfth day ceremony. Throughout the proceedings he showed his special knowledge of the ceremonies, i.e., he told the priest to take pinda first to Ramkund. He told me to retain in my grip the bones I brought, immersed in the waters of the Godavari at Ramkund till the close of the ceremony. The bones should be left in a particular hollow there and kept in position by pressure of the hand to prevent their being washed away by force of the current. My surprise was that even as I kept them they were quickly dissolving as though they were sugarcandy. On the twelfth day, he got a wire requiring his presence back at Bombay. He accounted to me for every pie he had received from me. He took me to the chief temples at Nasik. A Sanyasi teacher at one of the temples recognized him and to him he showed the wire. My priest said the G.S. was a man of extraordinary cleverness, e.g. when the priest started ceremonies without the worship of Ganesha (considering it unnecessary for inauspicious ceremonies), G.S. interposed and bade him start it and when the priest still entertained doubts, made him refer the matter to a learned authority who agreed with G.S. He parted from me at Nasik that day and promised to call at my place, i.e., Andheri. He gave me his name and address. After my return home, seeing that my beneficient friend did not turn up I went to the address given viz., "G.S., peon, Bombay Art School" and made inquiries and asked his fellow peon about him. They all said there was no such person at all known to them. The principal (the "Saheb") also said the same. Who was this 'man' that took such enormous pains (without any remuneration or prospect of it) and gave me such splendid help in securing Sadgati for my wife at Nasik by proper performance of all the ceremonies? Who can it be but Sai Baba? Page created in 0.342 seconds with 69 queries.